Final Four weekend is upon us and the UNC Tar Heels are back for their 20th appearance, most by any NCAA men’s team in history. Here in Eastern North Carolina the Tar Heel faithful are abundant. They want the best possible outcome this weekend, to see UNC raise another banner in the Dean Dome. However there are plenty of fans in this area who want nothing to do with the success of the Heels and are rooting for the worst case scenario in any situation. The ABC crowd. Well this is a story for everyone. Choose your own adventure. We will start with the lead up to the national semifinal game with Oregon. If you want the GOOD OUTCOME, check out the BOLD PORTIONS. If you want the BAD OUTCOME, check out the ITALICIZED PORTIONS. Follow the numbers and the letters, you’re smart, I believe in you. If you want a mixture of the two, mix and match as you go along. Enjoy! 1) The talk all week has been about the concerns surrounding Joel Berry’s ankles. After the Kentucky game, Roy Williams revealed that Joel Berry is dealing with a sprain in both ankles, also calling the star point guard a “tough nut”. Berry has been getting treatment all week long on both ankles. The treatments these athletes get are unbelievable and recovery time can be drastically shortened. Berry turned his ankle in the first half of the Kentucky game and managed to be back on the court after a quick trip to the locker room. Expect Berry to on the court no questions asked, this is too big of a moment for him to miss out on. Luke Maye jokes are the best, but he exploded onto the scene last weekend. Aside from his buzzer beater against Kentucky, Maye set his career scoring record against Butler only to raise it against the Wildcats. Pouring in 33 points over the two games, Maye contributed all over, gobbling up rebounds and clogging up the court. He’s not a small guy. If Maye keeps this momentum going, the Heels will have a surprisingly welcome addition to an already all-star cast of players. Justin Jackson, Meeks, Hicks, are all playing at an elite level right now. A healthy UNC team is poised to strongly finish this storied tournament run. 2) Joel Berry has been dealing with a pair of ankle sprains all week long. Yes, two sprained ankles. Roy Williams seems to believe that Berry is a “tough nut” but how much can a player as heavily involved as Berry really take on glass ankles. Berry is looking at playing limited action if at all. This leads to a heavy dose of Kenny Britt and Stillman White. Britt has underwhelmed all season, seeming to regress year after year at UNC after thinking he was going to be “the guy” for the Heels only to continually have someone surpass him as the Heels top point guard. Stillman White actually did look good against Kentucky, but the 24 year old (yes he’s 24) is just too…White, to use his given name. Britt and White are unable to lead the UNC offense the way that Berry is. Luke Maye. Oh Luke Maye. Prepare to see this giant meatball crash back down to Earth in a big way. Maye will become the player who is feeling himself way too much, throwing up shot after shot, getting in his teammates way and becoming a black hole for Carolina’s offense. Think Jackie Moon, if Jackie Moon was a werewolf. 1A) Oregon is a really talented basketball team, led by Wooden Award Finalist Dillon Brooks. On paper Carolina is a vastly superior team. ACC vs Pac 12. 2 Final Fours versus 20. The Heels belong here, Oregon maybe not so much. The Ducks were not expected to make it this far after star big man Chris Boucher went down with a torn ACL in their conference tournament. Oregon has a shallow bench, UNC can run deep. This has the feel of a game that the Heels can get well out in front of and work some of those bench players in, affording Berry a little bit more rest. UNC’s front court will have a sizeable advantage over Oregon’s small lineup. The combination of the rest and keeping the bench players involved and involved in the game plan will serve Carolina well in the national championship after they cruise to a double digit victory over the Ducks. Roy Williams has a slight advantage when it comes to minutes coached in the Final Four. 1B/2A)Oregon is smaller than the Heels, but they are fast and they are efficient. They love to shoot the three ball, and Wooden Award Finalist Dillon Brooks is the best of the bunch. Brooks is partnered with big man Jordan Bell who is coming off of back to back double double performances as well as guard Tyler Dorsey who has recorded 7 straight 20+ point games. A battered Joel Berry will not be healthy enough to right the rocking ship against the dauntingly quick small lineup of the Ducks. Nate Britt will finally get his opportunity to be “the guy”, but will still be outplayed by 42 year old Stillman White who will go for 6 points. Luke Maye will stand in the same exact spot he hit the game winner against Kentucky, giggling to himself as he wets his pants. The Tar Heels lose but take a lovely picture as a team in those stupid hats to show unity at the Grand Canyon the next day. Season over. Return to start. 2B) With Joel Berry playing a very limited role with his ankle injuries, the back court reserves step up to the plate. Led by Theo Pinson and Nate Britt, Roy Williams proves the “Fire Roy” crowd wrong and decisively coaches his weakened team to find a way. He did it against Arkansas and Kentucky, and he does it again here. The size of the Heels is too much for Oregon, dominating the glass against a Ducks team that’s biggest low post presence is only 6’9”. Kennedy Meeks goes for 15 and 15 while Stillman White drops 20 and wins the game MVP. UNC advances, still a little beat up. 1C) Going into the national championship game, Carolina gets completely healthy. Another day of rest and treatment has Joel Berry back at full strength and Justin Jackson is ready to prove he is a top notch NBA talent on the biggest stage. The Heels are matched up in a Carolina Civil War, facing the Gamecocks of South Carolina. The real USC is good, led by fiery head coach Frank Martin and SEC player of the year Sindarious Thornwell. Against the Gamecocks, Carolina will once again find a big advantage in the low post. Tony Bradley Jr. will emerge as a key contributor in this once as Roy Williams makes the bold choice to go with a big lineup. Meeks, Hicks, Bradley, Jackson, and Berry will carry a bulk of the load against South Carolina, and the Heels out rebound the Gamecocks bigly. The Heels dominate South Carolina and win their sixth NCAA title. If the Heels get the Gonzaga Bulldogs, they utilize their smaller lineup. Kennedy Meeks plays Przemek Karnowski tight as he did all game last week with Bam Adebayo, limiting the Zags top player. Joel Berry scores 15 in the first half to get his Heels out to a quick start, and Justin Jackson hangs a career high. 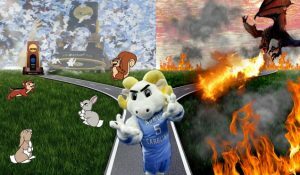 UNC has flashed the potential to play flawless basketball all year, and it all comes together in the final game of the year as they overcome last season’s bitter ending. The Dean Dome has a new banner. Go Heels Go America, or something like that. 2C) The Tar Heels have been bitten by the injury bug, Joel Berry continues to struggle and get healthy. His ankles are not ready for the title game as UNC rolls in to face the Gonzaga Bulldogs. Led by Przemek Karnowski (I don’t know how to pronounce it either), the Zags have the overwhelming size and strength advantage over the Heels. Nate Britt flounders in his chance to shine, turning over to the Bulldogs possession after possession. Roy Williams forgets what timeouts are and is caught whittling a duck out of a piece of driftwood on the sideline. Seventh Woods inexplicably plays more minutes than Theo Pinson as Williams decides to use his subs all wrong. Despite all of this, UNC is up two at the end of the game until Nigel Williams-Goss drains a Kris Jenkins-esque three to crush UNC fans around the world. Losers. Go home. Or back to the start of this article if you want this to play out a different way. Oh, and the NCAA announces the next day that the 2009 title has been vacated. You buncha cheaters. 1D) The best news that any college basketball fan can hear. “I’m coming back for another year”. Berry, Pinson, and Jackson all decide to return for another year. Tony Bradley develops into a star and Kenny Williams builds upon the success he had as a sophomore before ending his season to injury. Another solid recruiting class has UNC entering next season with 2 preseason All-Americans as well as a freshman of the year candidate. Roy Williams has built the perfect basketball program and has the Tar Heels poised to repeat as champions and appear in their third straight NCAA title game. 1E) Joel Berry and Justin Jackson both declare for the draft. Hicks, Meeks, and Kenny Britt all exhaust their eligibility. Roy Williams balks at the idea to start a rebuild at his old age and decides to retire and pursue his lifelong dream as a beach bingo professional. Luke Maye is promoted to a player-coach position. Kevin Keatts builds NC State into what UNC once was as the distant memories of great player’s jerseys hanging in the rafters fade into nothingness. Michael Jordan who? The Luke Maye Dome becomes an empty pit of college basketball nothingness. What a way to go after a national championship…..
And there you have it, some situations a little bit more ludicrous than others, but no matter how you want this weekend to play out, there is a situation in here that probably worked for you. 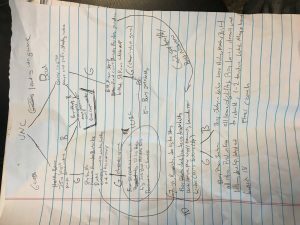 If this was all just too confusing to you just look at the crumpled piece of paper on which I made this bogus flow chart for this story. Journalism at it’s finest.